Here's a car that is going to give its competitors a run for their money, says P Tharyan. Many people say that Maruti Suzuki compromises on several fronts while making cars. I, however, feel the car-maker plays it by the ear, keeping current market trends in mind. The new Maruti Suzuki Ciaz is an example of this. 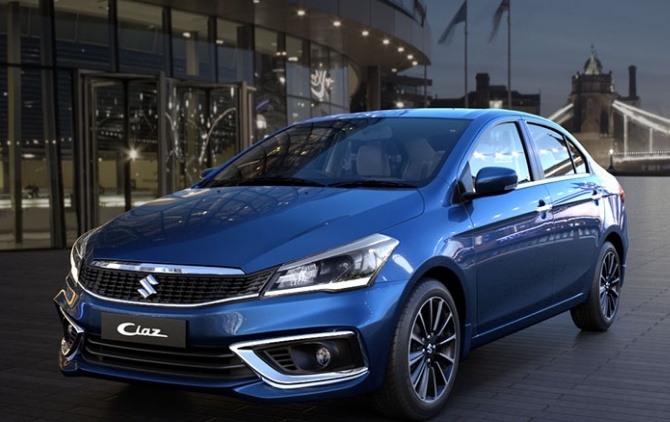 Cleverly packaged and cleverly priced, the latest Ciaz also comes with a clever combination of smart features. 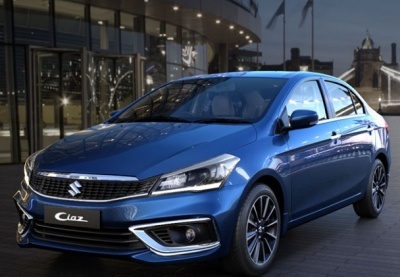 While its competitors, the new Hyundai Verna, the new Honda City and the Toyota Yaris, all have features that may give them an edge over the Ciaz, the market leader has a trump card up its sleeve -- a new 1462cc smart hybrid petrol engine, which replaces the earlier 1.4-litre engine. The vehicle comes with a smart hybrid technology. What this means is that the car has an inbuilt lithium-ion battery set-up. So, each time you brake, the energy, rather than being wasted, is stored in these batteries, as also in the lead acid battery, as part of a process called "brake energy regeneration". This, in turn, assists the engine's idle start/stop and torque assist functions.The energy stored in the lithium-ion battery pack also assists during acceleration. Not only does this help achieve optimal acceleration and performance, but this also increases fuel efficiency. 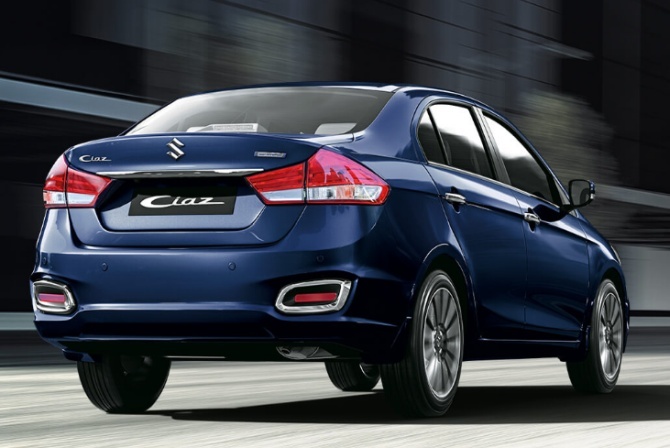 For a country obsessed with fuel efficiency, the Ciaz offers the best among its competitors. Despite the drum brakes in the rear and disc brakes in the front, the braking ability is in no way compromised, thanks to features like the anti-lock braking system (ABS) and electronic brakeforce distribution (EBD). While the car could have done with a few more airbags, at least in the top-end version, it's reassuring to know that it has features like reverse parking sensors, reverse parking camera, speed alert system and electronic stability programme with hill hold assist. As expected, the look of the car has also been jazzed up. Subtle changes have been made to the front and the rear. The grille and bumper are new, and so are the auto LED projector headlamps with DRLs and LED fog lamps. The rear gets an LED combination lamp. The car's good looks are further enhanced by the chrome bezels on the front and rear fascia. The rear bezels make it seem as though the car has dual exhausts. Inside, the new birch blonde wood grain accents, with low gloss finish and satin chrome highlights, add character to the dashboard and door trims. There is a new 4.2-inch, multi-information coloured TFT (thin-film-transistor) display and an analogue speedometer that changes colour depending on the driving pattern. 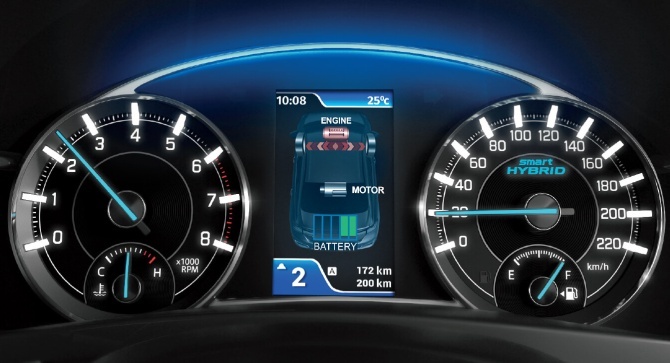 Displays on the screen include fuel consumption, energy flow, trip details and driving range. The automatic variant, however, does not get a gear shift indicator. 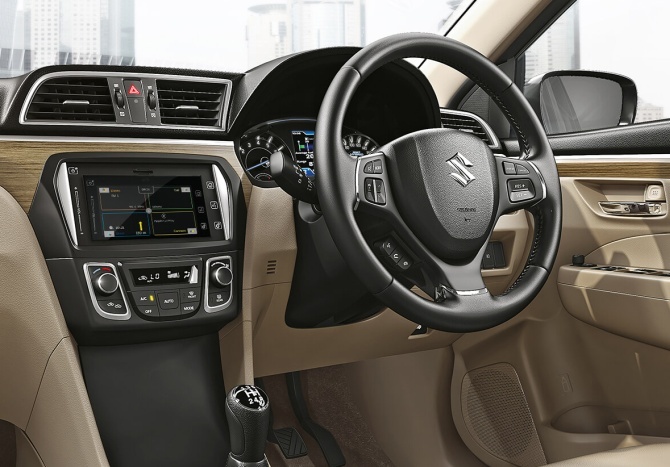 The 7-inch touch screen allows you functions like radio, navigation and call. This Smartplay infotainment system is compatible with Apple CarPlay, Android Auto and Mirror Link. The top-end model comes with leather upholstery, leather-wrapped steering wheel, chrome garnish, and so on. While the front seats are manually adjustable, and are extremely comfortable, the rear seats, too, are plush and practical and come with adjustable headrests. Rear seat passengers also get a power socket and air conditioner, but no USB slots. The Ciaz comes with manually adjustable rear sunshade, rear reading lamps and adequate leg, shoulder and head room. Here's a car that is going to give its competitors a run for their money. Images : Kind courtesy, Maruti Suzuki India.